Liberal Democrat bloggers are plesed with the attention they are receiving, not just from the other party leaders but the mainstream media as well. Nick Clegg has been getting some fairly positive coverage in recent days and some commentators like The Independent’s Steve Richards think that he has won the first round of the (potentially very long) election campaign. 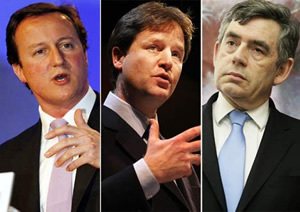 “Cameron and Brown flatter him (Clegg) and the media will take note by paying him more respectful attention. Such flattery has not happened to a leader of a third party before. Blair wooed Paddy Ashdown in 1997, but John Major did not do so. This appears to be a function of the possibility – perhaps strong possibility on current polling – of there being a hung parliament after the next election. Clegg has also been setting out the Lib Dems’ stall and insisting that the party is not involved in any “backroom deals” and that is will be the voters who will decide through whoever they give the strongest mandate to. The Lib Dem blogosphere has generally reacted positively to this. “I think it rather nifty piece of footwork from Nick this early in the skirmish. He keeps the activists happy and off his back with open talk of being centre left – and helpfully nodding to those Labour party voters “oop north” who will be comforted by Nick’s words, and might just be prepared to vote tactically if push comes to shove. “Each news bulletin through the programme actually repeated the party’s four main priorities at the election – reforming politics, a commitment to expanding the economy through green jobs, giving all children a good start in life through the pupil premium and fair taxation by removing income tax from the first £10,000. That is not something that always happens and is perhaps a function of the further coverage being gifted by the other party leaders. Stephen Tall on Lib Dem Voice is also pleased with Steve Richards’s comments about the party although he takes some of Steve’s colleagues to task for misleading coverage including their use of a recent Lib Dem Voice poll which showed that 58 per cent of respondents thought David Cameron would be the worst option as Prime Minister after the election in a straight head-to-head with Gordon Brown. Aside from the fact that for many Lib Dems this is like having to choose between different forms of torture, there are more than just Lib Dem members who read and respond to these polls on Lib Dem Voice. One thing that is worth bearing in mind is that a frequent charge against the third party by its opponents is that they are not relevant, as they are currently unlikely to form a government on their own, and that voting for them is a waste of time. Perhaps inadvertently, what the two main party leaders are doing by smothering Lib Dems and their supporters with love like this is making it a lot harder for this charge to stick. As Liberal Neil recently pointed out with respect to Cameron’s “love bombing” attempts, this sort of message makes it easier for Lib Dems to persuade wavering Tory (and now Labour) voters to vote for the Lib Dems, after all the other party leaders are effectively saying that it’s OK! For my money, I think that Gordon Brown’s claims that many of his policies appeal to liberal voters is very shaky (as I blogged about here on my own blog). I also think that there are many fundamental differences between the Lib Dems and the Conservatives that are very hard to reconcile. For example, there are hardly any Tory MPs (or indeed activists) who support any sort of meaningful electoral reform to a proportional system. Nick Clegg will doubtless be hoping that the rest of the campaign goes as well for him as the first few days of 2010.